Creating something to be treasured forever! Here is the first project I made with my April kit from Scrap'n With Flair. As always, there is a limited supply so get yours now here. I made this birthday card using my brand new Silhouette Cameo machine!!!! I am in LOVE with my new machine. I cannot wait to show you more products I will be making with it. So, this card was cut with my cameo. The card and cut out was a design I bought. You can see the wavy edge better in this picture. I then took a paper dollie and glimmer chalks (purchased at Scrap'n With Flair) and chalked over the dollie in the bottom right hand corner of the card (as you are looking at it). I took pearls (not in the kit) and stuck them around two edges. I took lace and wrapped to make this lace flower. I think it turned out so beautifully. I then took one of the flowers from in the kit and stuck it in the center of my lace flower. I took a piece of the patterned paper for the inside of the card and used the cutout to stamp Happy Birthday on. I also chalked the edges with the glimmer chalk as well. Once again, you can purchase this new kit at Scrap'n With Flair. I hope you liked my first creation. There will be more to follow so stay tuned. This whole kit is fantastic, Love your frame and card. My name is Tamara Renneberg but everyone calls me Tami. I am married to the most wonderful man and have 2 beautiful children. I am on the design team for Scrap'n with Flair and am excited to post my creative treasures. 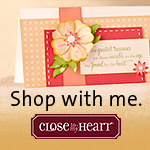 I am also a Close To My Heart Consultant and have been for the past 7 years. Cute purse that holds cards!